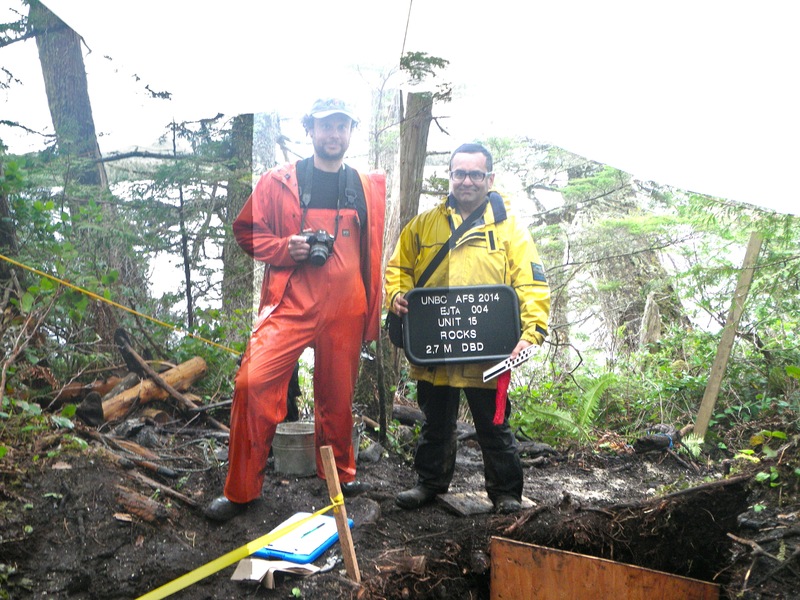 Deep unit at Luxvbalis, EjTa-4, Calvert Island. 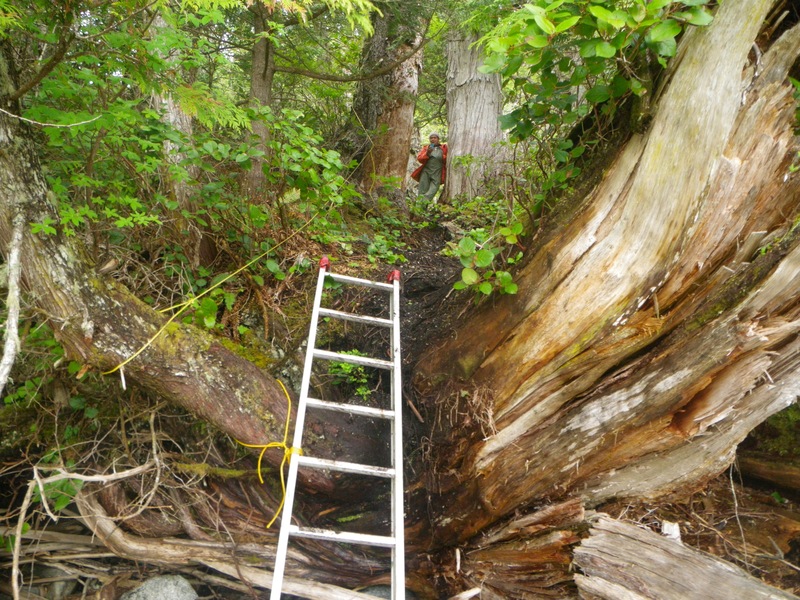 This blog’s world headquarters has temporarily moved out to the central coast, where yours truly is tagging along with Dr. Duncan McLaren and his team working on the early period archaeology and landscape history of the Hakai area. The project is sponsored in very generous style by the Hakai Beach Institute, which also funds and facilitates a variety of research on the cultural and natural history of this beautiful and sensitive area. 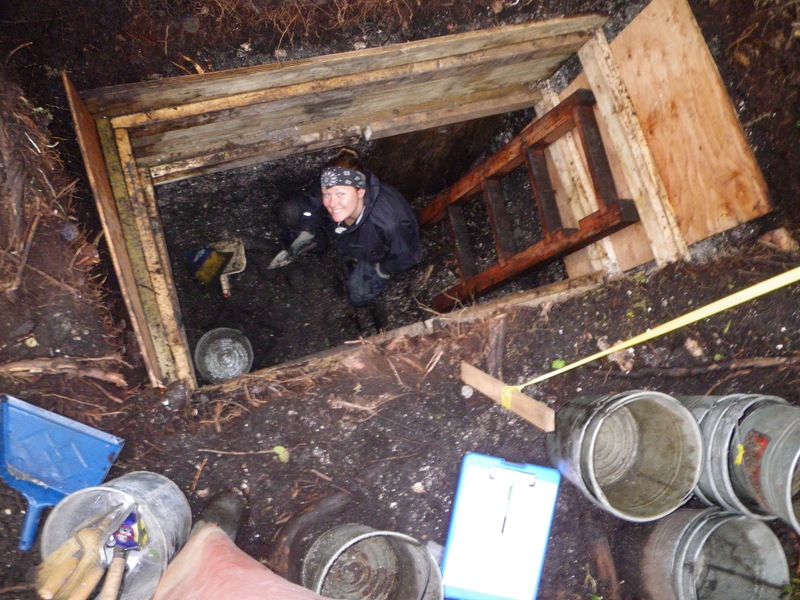 One of the other Hakai projects is an archaeological fieldschool directed by Dr. Farid Rahemtulla of the University of Northern BC. I wrote about this fieldschool once before and you can get some background on this site (EjTa-4, Luxvbalis) at that link. The site is in the traditional territory of the Heiltsuk and Wuikinuxv First Nations. Yesterday I had the chance to visit the site, get shown around by Farid, and hang out at the screens with his great students – and to be the annoying guy with a camera. So it’s a really deep site. Above you can see Kira Cari in this years main excavation unit. They are expanding a unit from last year which went down 4.7 metres or so without bottoming out. As of yesterday, they are about 2.4 units down. Basal dates so far are in the 6-7,000 year old range but this might get older since the bottom is not yet reached and there may be older cultural deposits intact in the intertidal zone as well. View from beach up to top of cultural deposits at Luxvbalis. The entire landform is largely anthropogenic. 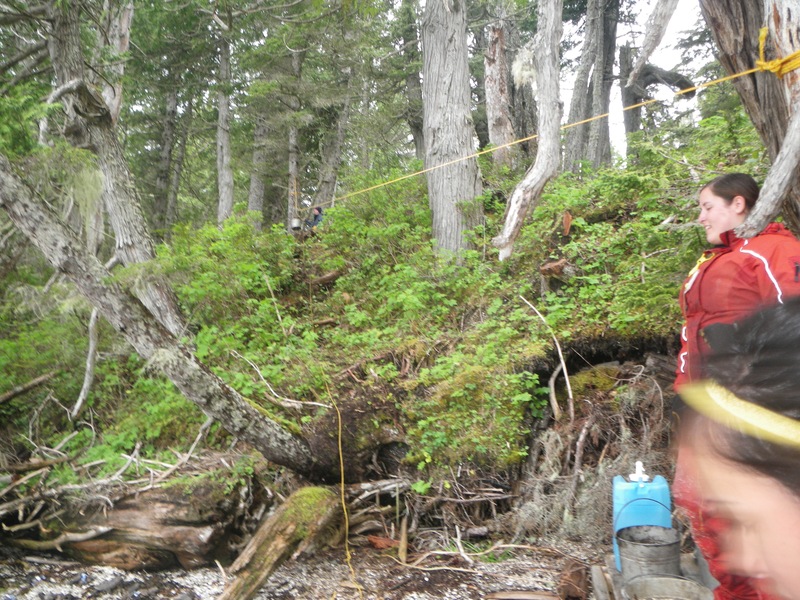 Above you can see the ladder has its feet more or less at the base of the site, and Josh Vickers, a Heiltsuk archaeologist, is standing at the top of the cultural deposits. Pretty much that whole vertical bank is 100% cultural material. It’s a massive site typical of these central coast locales where relatively stable sea levels enabled very long-term continuous occupation. Other sites in this region such as Namu and Kildidt Narrows (ElTa-18) have occupations of up to 11,000 years which is very rare at a global scale. At this site, there are no historic artifacts at all and the uppermost dates are more than 300 years old, suggesting the village was abandoned before Europeans arrived on the coast. The reason for the abandonment is unknown, though I heard theories floated of both a Tsunami disrupting local lifeways and the possibility of an over-the-contact-horizon epidemic of introduced diseases. The sheer height introduces it’s own problems. This is the zip line by which full buckets are passed from the excavation units down to the screens, and empty buckets passed back up. You can see I also caught one of the zombie field school students in the bottom right. Zombies work hard and have simple dietary requirements. The screens are down on the beach with a nice view of Mt Buxton on Calvert Island in the distance – unexpectedly perhaps, there is a webcam up there. Here you can see Seraphine and Graham, two of the UNBC students at work. The day also saw the visit of High School science students from Bella Bella, a nice example showing science and culture in action in an applied setting. I hope to make a post or two with some general information on what Duncan and his group has been up to as well. His field season is almost wrapped up and without being 100% sure there are some very intriguing and interesting finds so far. It’s a tremendous benefit of the Hakai program to be able to implement a long-term research design which produces incremental results. Duncan McLaren and Farid Rahemtulla at Luxvbalis, which rocks indeed. 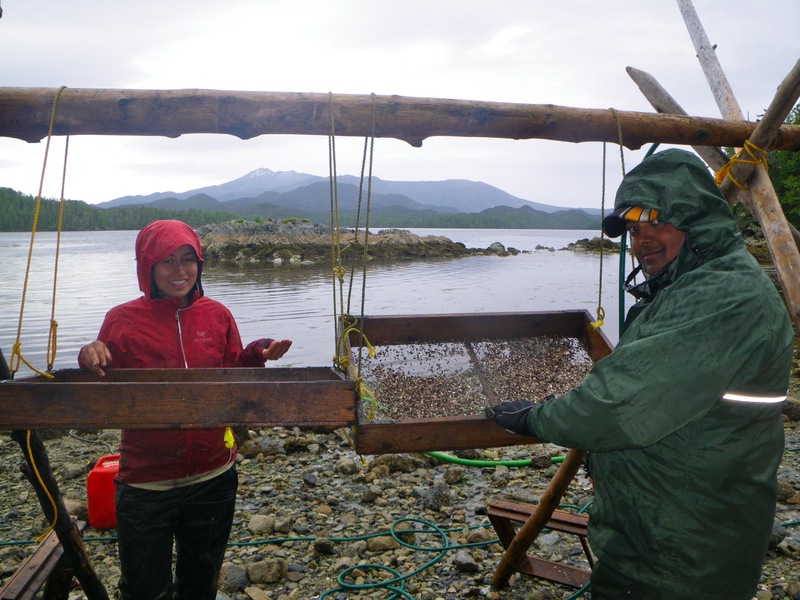 This entry was posted in Archaeology, fieldwork, Northwest Coast, Shell Middens, Teaching and tagged Calvert Island, Hakai Beach Institute, Hakai Pass, Heiltsuk, Tula FOundation, UNBC, Wuikinuxv. Bookmark the permalink. Hi Quentin, Great blog post! It was great to meet you and briefly work along side you. Hope we cross paths again someday. Have a great summer. Hi Cari, sorry about the name thing! I fixed it. Hope the field school is still going well. Four levels a day, c’mon, y’all can do it. Stay in touch. No problemo. It was great to meet you! Have a great summer. I love your blog Quentin! love the platform to disseminate knowledge from a scholar that does not require elite log in credentials for publication journals.